Clyde Marine Services' new catamaran CLYDE CLIPPER, seen recently out on trials, paid a visit to Dunoon on Tuesday afternoon. Seen here alongside the linkspan berth at the old pier, she berthed initially starboard-side to, then turned around and berthed port-side to before berthing briefly alongside the breakwater. Following these trials, she returned to Greenock. The long-awaited announcement from the Scottish Government about the future of the Dunoon ferry service was finally made at the very end of last year. 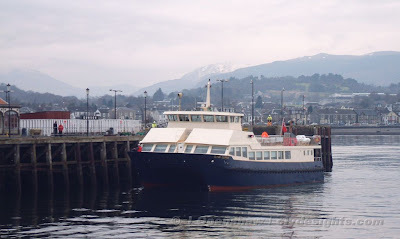 Prospective operators have been invited to intimate their interest to the Scottish Government to operate the service to Gourock over a 6-year period from June 2011, with an subsidy being made available for around £1.5-£2.0 million per annum. Currently CalMac is in receipt of around double that figure. This subsidy is for passenger traffic only, and operators will be allowed to offer an unrestricted service, using vessels of their choice. New link posted - hopefully this one will be okay!